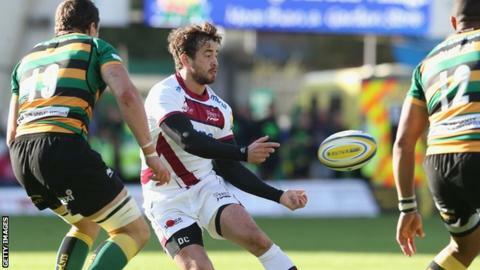 Sale Sharks director of rugby Steve Diamond has told fly-half Danny Cipriani not to be distracted by the upcoming England squad selection. Cipriani, 26, is competing with several number 10s, including Owen Farrell, George Ford and Stephen Myler. England head coach Stuart Lancaster names his squad for the autumn internationals next Wednesday. "He's just got to keep doing what he does, whether he gets in it or not," Diamond told BBC Radio Manchester. "He's been playing well when the team hasn't been playing well." Cipriani, who is in the last year of his contract at Sale, appeared in two of the three Tests against world champions New Zealand in June, after an absence of almost six years from the international scene. "Danny Cipriani is making things interesting at fly-half for England. Cipriani and Bath's George Ford attack flatter, harder and quicker than current England first-choice Owen Farrell. But Farrell is standing flatter himself of late and has undeniable composure, a strong will and is stronger physically. And, as he showed in this year's Six Nations, he allows the rest of the back-line to play. That's why Stuart Lancaster thinks so highly of him and why he is the standard to which Cipriani and Ford must aspire." Lancaster is visiting Sale's Carrington training ground this week to discuss his options and Diamond indicated he would be giving Cipriani a vote of confidence. "At this moment in time we've not got a dominant pack, behind a dominant pack he's a different player," he said. "Who is going to win you a game with the other 14 fantastic players around you? Stephen Myler or Cipriani?" Meanwhile, the Sharks are preparing for their first match in the new European Rugby Champions Cup, against Irish Pro 12 side Munster at the AJ Bell Stadium on Saturday. Sale have only won two of their six Premiership games this season and with Saracens and Clermont also in the group, they have been handed one of the toughest draws. "One will imagine they'll be looking at us as the whipping boys and that's exactly how I want it at the moment," added Diamond. "We know they're [Munster] a ferocious team at the breakdown, they've got world class players and the big Celtic league clubs, this is when they peak. "We're playing against last year's three semi-finalists in our group, one of them isn't going to go through."